Humanists now have their very own guidebook to living. British philosopher A. C. Grayling edited the book as a secular, non-religious alternative to the holy book of the Christian faith. With his new book, which is designed to appeal to people’s Bible sensibilities, the philosopher hopes to make a dent in religion’s monopoly on ethics and wisdom. The book, called simply The Good Book, is modeled largely on the Bible. Not only does it look like the typical Gideon Bible one would see in a hotel room, but it is organized in the same way as a Bible. 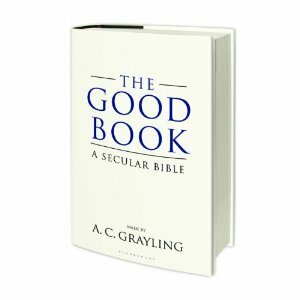 Just like the Bible, Grayling’s book is divided into smaller books, each of which is divided into chapters. In turn, these chapters are divided into verses which deal with topics pertaining to nature, the universe, and humankind. However, its teachings are left anonymous, and only through research does the reader discover the identity of the authors, which include largely atheist, agnostic, or apatheistic thinkers like Aristotle, Swift, and Darwin. By using the Bible as a prototype, Grayling hopes to capitalize on the powerful imagery of the Bible, giving his book a greater chance of success. But the gospel he is trying to spread is very different from the gospel of the Christian Bible. Rather than teaching the reader that salvation lies in accepting the sacrifice of Jesus Christ of Nazareth, it teaches values from the humanist traditions of ancient Greece, Rome, and China. These traditions, Grayling believes, have been overlooked and pushed aside by the worldview of monotheistic male-God traditions. While competing with the Bible may be a daunting task, Grayling’s marketing strategy is clever, and at the very least will turn heads. Indeed, it is easy to imagine innocent passersby reading the title and wondering exactly what lies within—and ending up reading, maybe for the first time, Voltaire’s views on God, nature, and the universe. At the very least, it should open up a dialogue and get people talking. At the most, it will force people to re-examine their own beliefs and change their worldview entirely. But, people are stubborn and that will take some work. As a minister ordained online in an interfaith church, what are your thoughts on the new humanist Bible? If you did not know who the authors were, would it make you change your mind about some things?